Anyone who has spent more than a few days in India knows that its larger cities are so awesomely crowded that they can draw the life out of you if you let them. One of the key pieces of advice for leisure travelers and expats alike is to find one of the rare places that doesn’t feel like a subway station perpetually at rush hour, and Fort Cochin is one of those places. 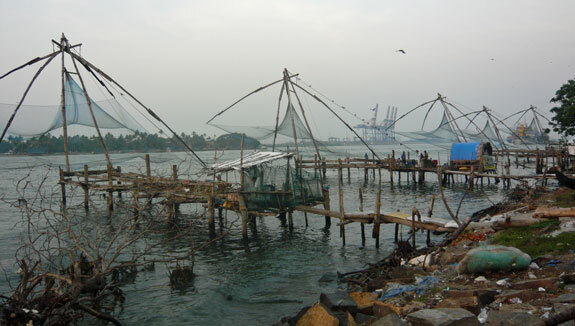 Originally conquered by the Portuguese and then later the Dutch and then the British, the city is officially called Kochi now, but the small colonial district out on its own island that is popular with tourists is still usually known as Fort Cochin or sometimes Fort Kochi. It’s the most touristy part of the southern state of Kerala, which is also known for its stunning backwaters that are only about an hour away from Fort Cochin by car or bus. While it’s true that the central part of the actual city of Kochi is nearly as crowded and busy as most of the rest of India, the small and historical colonial area is always rather peaceful. It’s isolated at the top of a small island that is partly dominated by a naval facility, and the housing density is limited due to the centuries-old architecture that takes up the entire town. There are also several large parks and other green areas, plus a few decent sandy beaches, so it doesn’t have that feeling of desperation that is present in so much of India. Speaking of architecture, Fort Cochin is filled with excellent examples of colonial buildings that have that “distressed” look to actually make them more interesting looking, as well as a great number that are kept up nicely and run as expensive hotels or expat homes. You won’t see many cows wandering the streets of Fort Cochin, but you’ll see dozens of goats, especially near the main cricket field in the center of town. The most famous landmark is the series of Chinese fishing nets at the northwest corner of the island, which are still in use today. Groups of fishermen lower these enormous things into the sea and then a bit later they haul them up as quickly as possible, snaring whatever happens to be swimming through the area at the time. Tourists walking by will be encouraged to join in the net-pulling part, and then you’ll be asked to tip the men even though you just did part of their job for them. You can buy the just-caught fish at several stands nearby, and then pay a cook at another stand to prepare them for you. Also worth a look in an area adjacent to the main tourist/expat section is a historic industrial area that is still the center of the local trading and shipping industries. The non-PC named “Jew Street” is still home to dozens of warehouses and retailers that deal exclusively in spices, which grow abundantly in Kerala and still bring in good prices around the world. 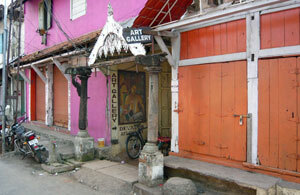 In spite of having quite an idyllic feel to it, Fort Cochin can be nearly as cheap as the cheaper parts of India. Hotels starting at around US$10 per night are not hard to find, but there are also many boutique 4-star hotels that start over US$100 per night. The food scene is similar in that you’ll be able to get a plate of chicken fried rice, even at a touristy restaurant near the beach, for between US$1 and US$2, but there are many hotel restaurants and boutique places with prices 10 times that figure. Fans of alcohol could be a bit frustrated in Fort Cochin as its laws only allow drinks to be served in a very few places. A big bottle of beer will be a bit over US$2 each, but most cocktails will be quite a bit more, unless you buy raki from a secret bootleg vendor with the help of a local. India is so big; I wouldn’t know where to start whenever I visit. Thanks for this information.